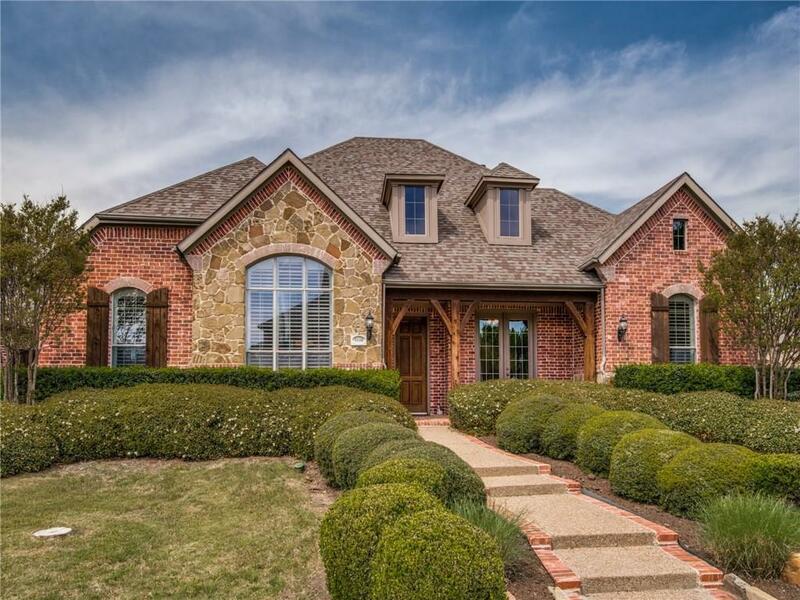 Beautifully appointed Highland Home located in popular Eldorado Fairways. Builder's personal home. Great floor plan with master suite, 2 bedrooms and study downstairs. 3 baths downstairs. Fourth bedroom could be game room. Has closet, door and full bath upstairs. Features include plantation shutters, nail down hardwoods throughout most of downstairs, crown molding, stone fireplace, built ins, granite tops in baths, large covered patio, surround sound, plus more. Kitchen has stainless steel appliances, granite countertops, 5 burner gas cooktop and brick flooring. Replaced HVAC. Walk to community pool, 8 acre park, playgrounds and jogging trails. Highly rated Frisco ISD.